The celebrated life of world famous astronaut Neil Armstrong has passed last weekend. As a tribute, all weekend I observed the moon. 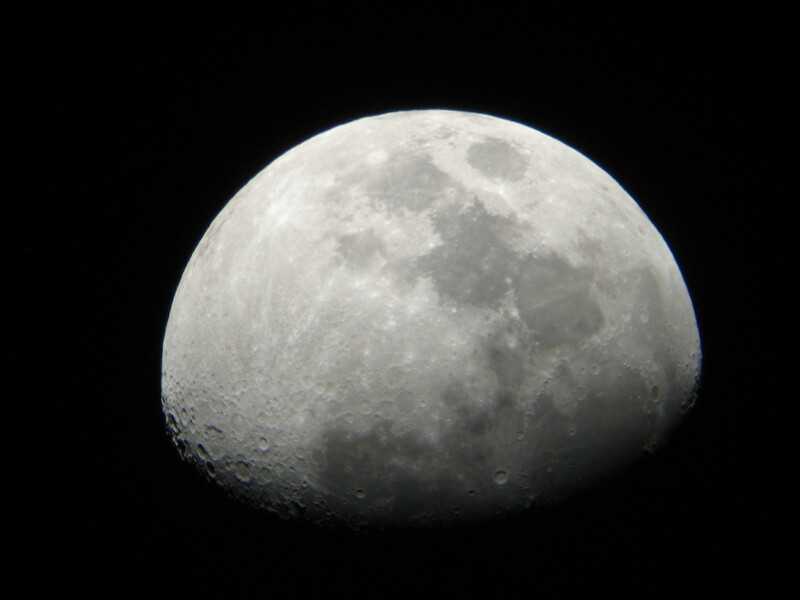 From Friday to Sunday, I viewed the moon on every night using my dad’s 6 inch reflector and my regular- 70mm f/10. My dad had just gotten one of those sky and telescope moon maps and he was using his little 4 1/2 inch reflector. It was the day after first quarter, so it was pretty bright by then. My dad was busy with the moon, I looked up and noticed how transparent the sky was! If you remember me talking about seeing the central star in M57, this night was 10 times better than that. Honestly, I think pretty much any night would be better that that one, but the Milky was seen, it was not bright, but it was there. I viewed M31, Andromeda Galaxy, and countless others. The 2 other days were remarkably clear, in fact, I actually logged in many Messier objects for the program from the Astronomical League. Only 22 left! I have also been encountering severe moisture in the air late at night. After 2 or 3 hours of observing, I come in and it looks like my equipment was just sprayed with a garden hose. I guess that means that fall and winter are on the horizon, because it’s been cooling down more lately. More recently, it barely cools at all. At 11:00 last night, it was still something like 83 degrees. So I guess the heat is still to stick around for a little longer. Regarding small scopes, the 70mm has become quite a performer. 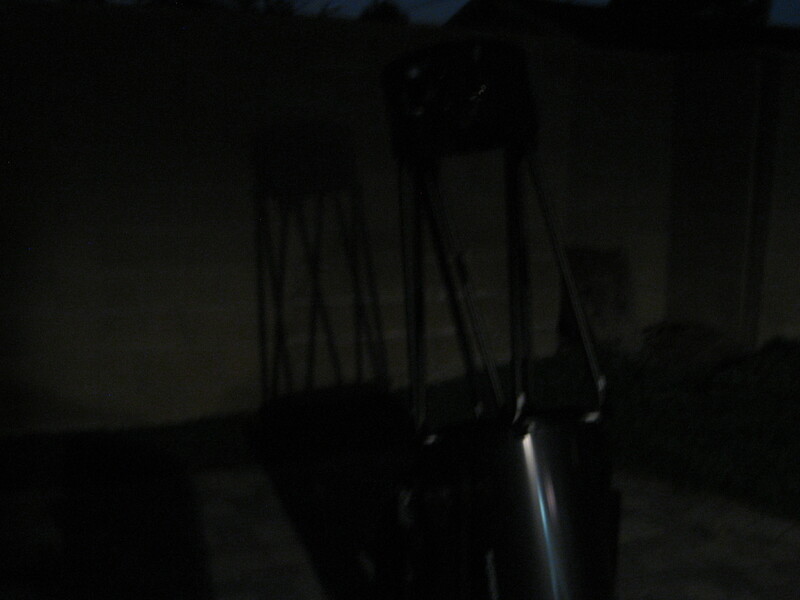 One thing to add before I go into a small discussion of moon scopes, I just cleaned my telescope lenses last night. The telescope is a second, meaning that it had minor imperfections There are a couple scratches here and there on the tube, but after thoroughly cleaning each lens, They were pristine. 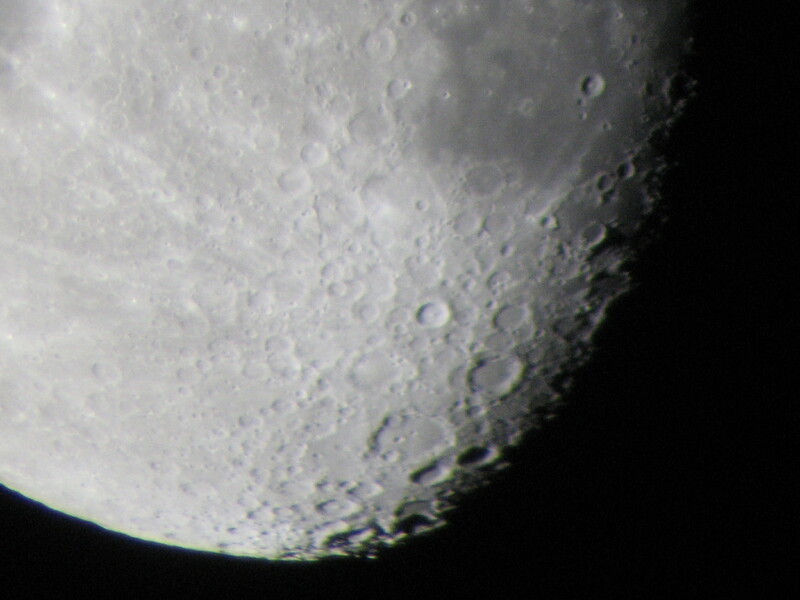 They actually looked better than when I first got the telescope. On to the moon scopes. The 70mm f/10 is an excellent choice. It pulls in a fair amount of light, and has a long focal length for that size (700mm). For example, Sunday night I counted 5 crate-lets on the floor of Plato in full sunlight. It seems that refractors have an advantage over reflectors because there is no central obstruction. For that reason, refractors will always have sharper crisper images than reflectors. 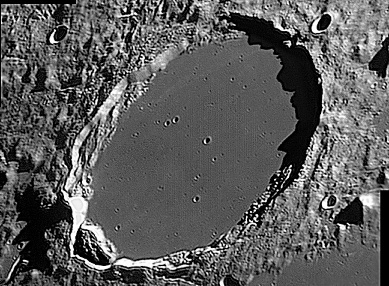 Virtually any decent Refractor will prove to be an excellent lunar scope. I love medium to large scopes too, and my serious aperture is Orion’s 10″ classic dob. I probably said that before, but it’s such a cool scope. By the way, I didn’t take this picture of Plato! The project is going very well, I am not posting as much as usual, I started school on Monday, and Wednesday is my best day to do this sort of thing. 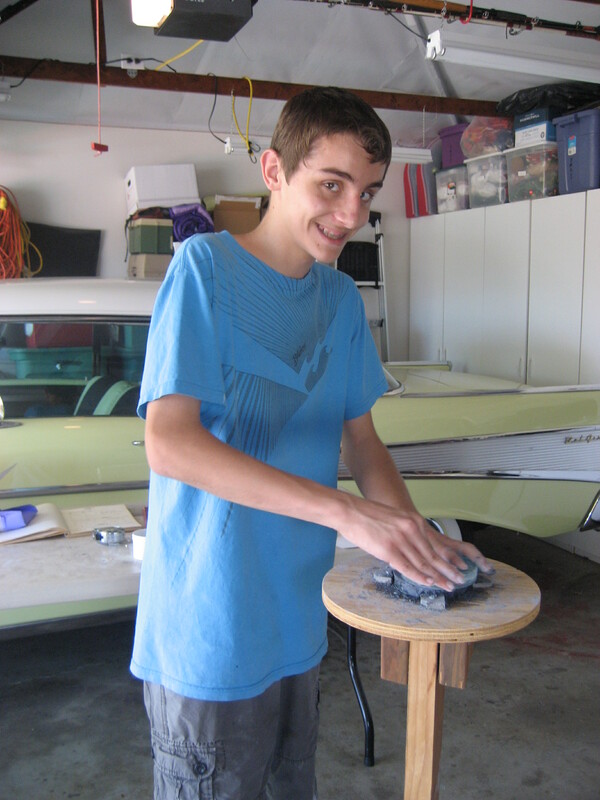 The 80 pound grinding was rolled into the garage, then it was leveled. The next step was to bring a table so that all of the supplies could be in one place. For the instructions, I called my grandpa, he has built 3 to 12 inches telescopes in the past. I had little wooden cleats cut to hold the tool in place. Also for instructions, I used Amateur Telescope Making and Building a Reflecting Telescope, which was written by my grandpa in college. To start off, I sprinkled on the tool 1/4 teaspoon of #80 silicon carbide on the tool, then 1/4 teaspoon of water and spread it all around. The next thing to do is place the second disk on the tool and push the mirror firmly away from you, as far as it will go, then do the same, bringing it back. Make sure to time the whole process. For the 4 inch mirror, 30 minutes should be good or around there. When you slide the mirror off the tool and rinse it with water, it should look rough and frosted, which is exactly what it is. 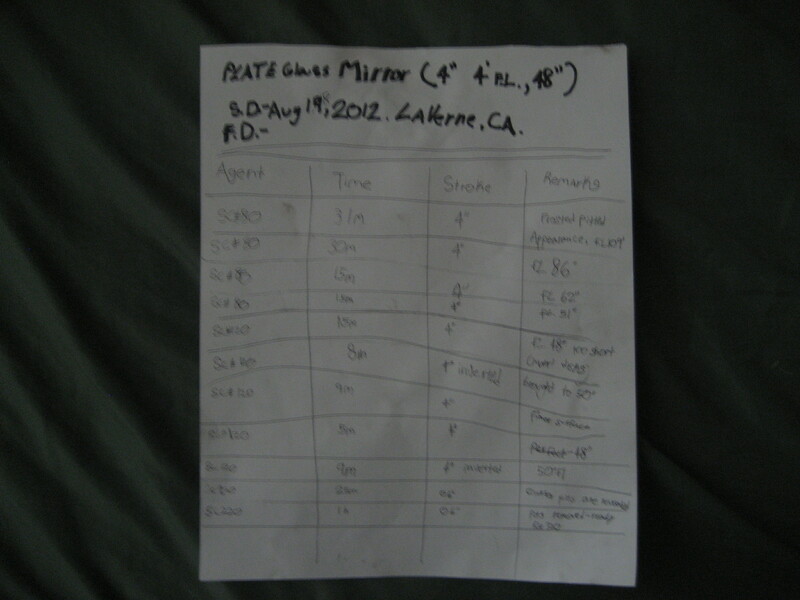 To check the focal length, I took it out in the sun, and wet the mirror. The next thing is to reflect the sun’s image onto a wall or something flat. Move the mirror to and fro the wall, keeping it wet, until the smallest image is obtained. 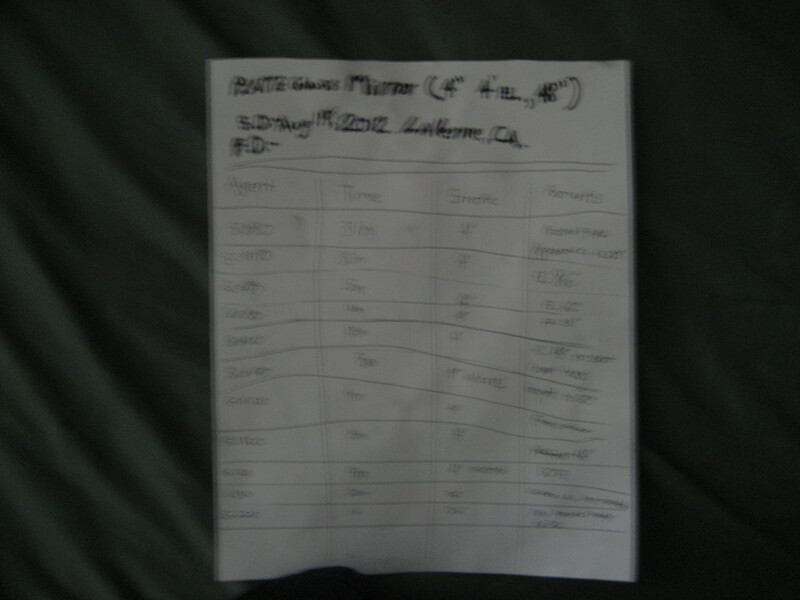 I then measured the distance between the glass the wall, to determine the focal length. The whole process is very intriguing and it is lot’s of fun too. I ground all the way to the second abrasive, #120, finished that and went back the next day to do the #220. After 30 minutes of grinding with it, the surface smoothed enough to reveal some pits, which I removed. Another great idea I had was to set up a grinding log to show all of my progress. 2 days have already filled practically the entire page. The night before I started, I had one of the best observing nights in my life. The seeing was a 6 out of 10 and there were scattered clouds throughout the sky. Me and my dad were outside using the XX14g. At the time, it was 85 degrees, at 11:00 at night. I thought about making a sketch of the M57, which was at the zenith at the time. Upon studying it, I always detect a little green-blue color in it. But this was different: the center star was seen in the moments of good seeing. Instant chills went throughout my entire body as I glimpsed that single star. I’ll never forget that one moment. At the beginning of the night, we were setting up everything up, and we had the big floodlight on to see what we were doing. Just before it turned off I took this picture of the scope, you should click on it to see the big version. Anyway, I am hoping to finish the mirror project by the end of October. My dream telescope that might be within reach is Orion’s 10 inch Classic dob. I’ve heard lot’s of good things about them and maybe I can own one someday. The last week or so, there have been clouds everywhere and no observing whatsoever. I thought this would be a great time to start my telescope making project. I am sure that as soon as I start, there will be an extrordinary night. Anyway, I have finally collected all of the materials necessary for my project. 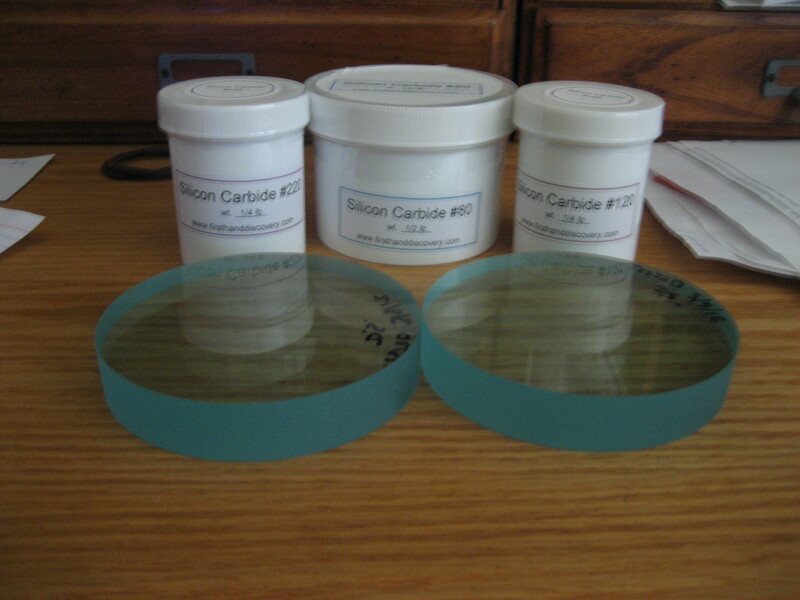 My first 3 grades of abraisive (Silicone Carbide) came today. The first 3 grades are, #80, 120 and 220. With shipping and tax, this came to about 18 dollars. 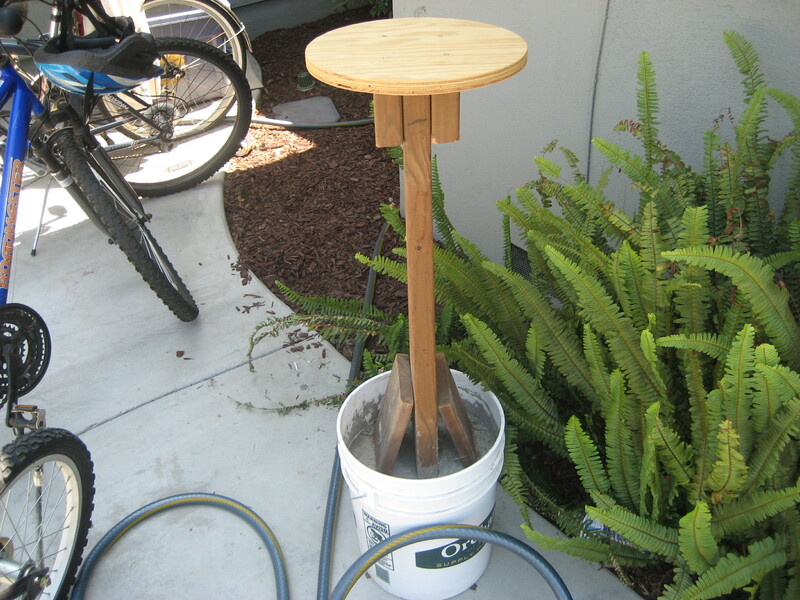 My grinding stand has been completed, I have the blanks so now all I have to do is start making it! The first thing to do, will be to fasten the “tool” to the stand. This is done by 3 wooden cleats that hold the glass in place. Before starting the work, you must make sure that you use old clothes, or an apron as will this make a mess. I will lay some trash bags down on the floor and wet all of the surfaces to minimize dust. This is not necessary in the beginning grinding stages, but is critical later on. I wish I had more time but I’m starting school on Monday and will not be blogging as much as I have. I plan to start my project tommorow and I am making a video on it. I will most likely show it at my club, PVAA. If you would like to see this video, I’ll probabily put it on YouTube and if not, I can send you a copy. 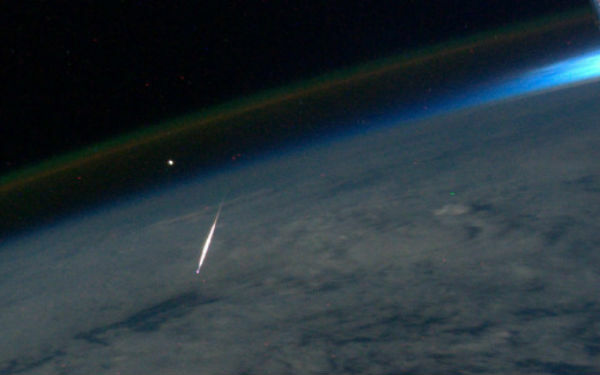 As many of you have heard of the meteor shower the past 3 days, I had been up on the second day, thinking that it was the peak of the show. The weather has been pretty iffy lately and these clouds come in from the east. Then they stay right where they are because there is no breeze to blow them away. Anyway, it wasn’t very good at my house, which is heavily light polluted. But I did have PVAA’s loaner 8 inch scope handy and used that most of the time. I was up ’til about 1:30 in the morning, and by that time, M31 (Andromeda galaxy) and M33 (Triangulum Galaxy) had come up pretty high. M31 was a cinch, and was glimpsed naked eye. Nearby was M110, which was very bright. M32, which is right on M31 was not visible, I have never seen the dark lanes or globular clusters in M31. The next target was Stephan’s Quintet, I hope that’s spelled right. I was unable to snag the grouping of galaxies. By that time, Scorpius was below the horizon and the teapot was practically invisible. All in all it was a great night, except for the main attraction, I counted a lousy 20 meteors. I have thought it would be interesting to sketch them, so at some point, I will attempt to. I have seen some with double tails, in all different colors. I have been looking online for some UHC filters, I don’t care what brand it is, and I have found a site where they sell pretty cheap. Kson Optics has been around since the 80’s and make telescopes, mounts, rifle scopes, and scope accessories. I have not found the actual filter on their site, but it does come in a filter wheel along with planetary and other DS filters. I checked on Amazon for them, and the cheapest model is around $40. So it seems like that’s the cheapest I can find anywhere online. For years I thought an 8″ scope was a “lifetime” scope. Probably around 15000 DSOs are reachable, and pretty much all star clusters. You could spend a lifetime with one and become quite an accomplished observer. But my interests shifted more to galaxies so I moved up “a magnitude” to a 12.5″. And while I certainly can see more galaxies and details therein, the biggest difference in appearance came with the mundane, easily visible, brighter objects. After reading this list myself I thought hey, I want to see that stuff too it sounded like lot’s of cool things are reachable in telescopes of modest aperture. I have something to add that’s possible in scopes of a minimum of 8 inches: the moons of Mars. Everybody’s all excited about Curiosity landing and all, but I found out how to view it. It involves “occulting” the eyepiece. The process is to take a piece of foil, painted black and cover half the lens of the eyepiece (on the inside). This effect when positioned correctly will block out the light of the red planet and allow the Moons Phobos and Deimos to be seen. This must be done on a telescope with perfectly clean optics, perfect collimation, and a reasonably good night. I found out about this in a booked called Astronomy Hacks available through amazon. Mars is getting low in the sky, but why not give it a try? 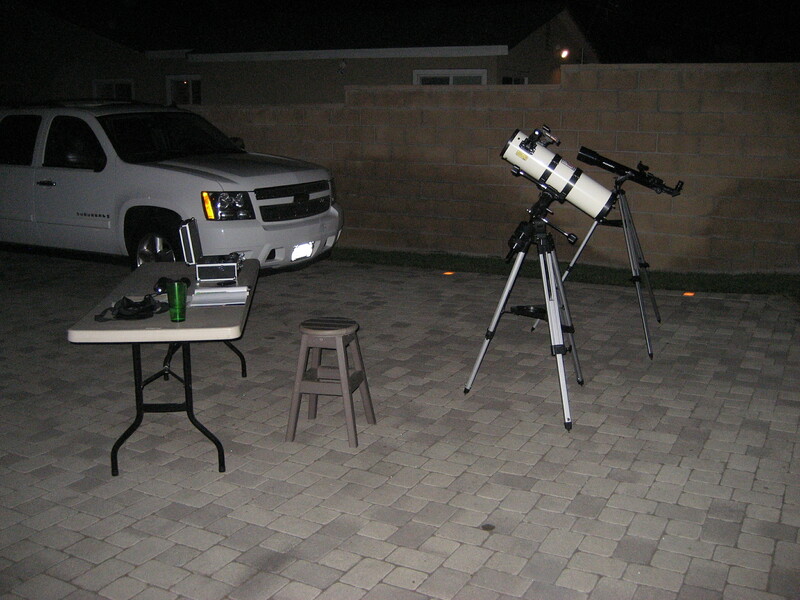 PVAA member Matt Wedel who has a blog http://10minuteastronomy.wordpress.com/ has proposed a new observing program. His idea is to observe all 110 Messier objects from a suburban location with a small telescope that a beginner would start out with. He has chosen a 90mm mak for all of his observations and I am still contemplating on which scope I should use. The 14″ and 8″ is out, as well as the 6″, so that leaves me with my 70mm (2.75″) or my dad’s 41/2 inch reflector. Also, I could wait and finish my telescope which should have already been about finished at this point. 4 inches is probably something that a beginner would start out with. There are many other factors that you have to put in, like using a run of the mill Kellner style eyepiece, of using Tele Vue’s Ethos or Nagler types. In my project, I am just going to use regular inexpensive plossl eyepieces. All of my plossl’s come from Orion telescopes. Another factor that I have really thought about is the use of filtering. I mean, would an average beginner really own a UHC filter? It is still something I am thinking about. Another factor is the use of finder scopes. They vary from optical gun sights red dots, lasers, the list goes on and on. But, once again, this brings up the telescope I am using. I am reluctant to use the 70mm, because it is a small aperture for all of the Messiers. So I am just going to go with my gut and choose the 4 inch, but it is a rather risky move because it hasn’t even been made yet. I got as far as the blanks and grinding stand, but still haven’t ordered the grits. That’s because our internet has been down for about a week, which is why I haven’t blogged. Another question, how will observe and record the observations I take? I am going to find it with a Messier chart, take extensive notes, and make a sketch. Something else I have thought about is magnification. It would be a good idea to use the same magnification on all of the observations because then the relative sizes of the objects can be documented. I am assuming that Matt is going to observe all 110 of the Messiers, but I am thinking about doing his older version, which brings the total to about 104. Some of those later Messiers are going to be a huge challenge, on an average night at my house, M51 (whirlpool galaxy) is just barely seen with the 14″. So its going to be a challenge. I would love to get this started right now, but I am currently working on AL’s Messier Program. The telescope is also not finished. So, let’s go over everything I am going to try to do. I am going to observe 104 Messier objects and document them with a sketch included, find them with run of the mill star charts, use average eyepieces (Plossls), and use regular finder scopes. The one I have chosen to use is a 6×25 finder scope from a Tasco telescope made in the 1960s. There is one other thing, would you like to join me? I have already chosen to observe with Matt, but If you’ve got a telescope, why don’t you try it yourself? There are no hard set rules, so you can tweak and change them as you please. I am trying to replicate the beginners observations so they would know what to expect. If you have any other reccomendations of other rules I should add it not, tell me. Happy observing!